They will give u very high performances, but if u have spirited style of driving like mine then your tread will run out pretty fast. Tread wear is a weak point of these tires. Wount change brand never, Nitto is oe of the best tires, if u like racing this is the one u need! Perfect dry grip, they gives absolute control of your car, high speed handling is very well. Sticks on the road like glue. One on my favorite tires. Those tires are sport performance tires, handle high speed very good up to 150mph. 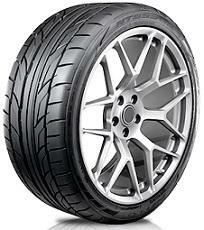 Tread wear depends on the way of use, I do like brutal starts and hard cornering witch makes semnificant tread use. Absolutly ultra Hugh performante, i have spiritele style of driving andd they perform just great, one i got nitto i wount go for other brand! I usually use Toyo, but this time i tried Nitto, in conclusion i want to say bye toyo! nitto very good tyres for all type of driving, well ofc except snow and ice!